PARIS, France (PAMACC News) - Mombasa Governor Ali Hassan Joho has signed a 200 million USD loan agreement with the World Bank that will guarantee water for Kenya’s urban areas. Joho who signed the pact on behalf of the Council of Governors (COG) at the ongoing climate conference in Paris, France lauded the initiative, terming it a solution to the country’s persistent water problems. 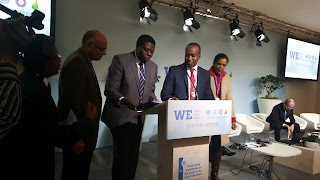 Kenya’s Minister for Water Eugene Wamalwa who was present supported the initiative. “While it is the function of the National Government to develop water resources, county governments provide water and sanitation to the citizens. I am here to show the world that the two levels of government in Kenya are working together to ensure that citizens get clean water,” Wamalwa said. The money will be used to construct Mwache dam to provide water to entire Coast region including Kwale, Tana River, Mombasa and Kilifi as a water climate resilience initiative. The project has three components: Mwache dam and related infrastructure component will finance the construction of the main dam (Mwache), one check dam, raw water transmission lines (gravity-fed) to the treatment plant and transport infrastructure around the dam as well as supply electromechanical equipment and buildings related to the dam site to the water supply system in the coastal region. The project will also support development in Kwale county where the dam is located, through investments in water supply and sanitation in rural communities and small towns; a demonstration irrigation scheme to inform, design and establish the viability of a large scale irrigation programme in Kwale in the future and livelihoods investments support. The project management component will finance the required office space, goods, equipment, staff, consultant services, travel, training, and operating costs that will allow for the successful implementation of project activities. 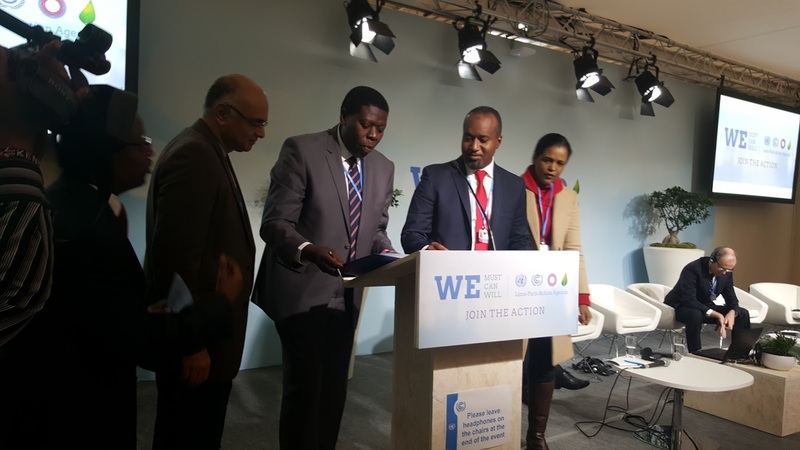 “I thank the World Bank and other partners and this shows that COP21 is a testimony that working together can help nations build resilience against the adversity of climate change,” Joho said. Baringo Governor Benjamin Cheboi supported the project, saying that water is critical to solving the effects of climate change. “We have witnessed conflicts in our country especially in my county due to water. We should strive to provide water to all,” Cheboi said. Laikipia Governor Joshua Irungu echoed Cheboi’s sentiments calling for more collaborative efforts between county and national governments to provide water to Kenyans. Kwale Governor Salim Mvurya who didn’t travel to Paris due to other commitments said he fully supports the project. “We welcome the project as it will improve the lives of our people and reduce the burden of disease,” Mvurya told The Standard on phone.